Where F is force, m is mass, and a is acceleration. et fieri secundum lineam rectam qua vis illa imprimitur. and is made in the direction of the right line in which that force is impressed. compounded from the determination of both. Many of the terms here are actually references to momentum and the change in momentum of an object which we will explore in a couple of weeks. Avoiding this term for now, we can think of the alteration of motion as the acceleration. And the motive force as the sum of the forces on an object. where Fnet is the net force or the sum of the forces on the object which is being accelerated. So what this equation tells us is that several forces acting on an object of mass m, will result in an acceleration. 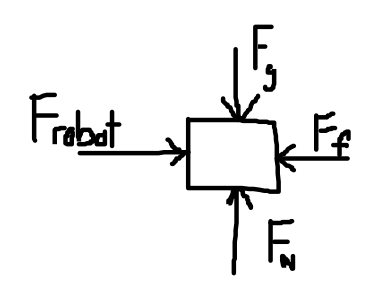 Acceleration a, and Force F are written with bold lettering because they are vectors, and have a direction. What this also tells us the the direction of the acceleration is the same as the direction of the Net Force. As Newton writes “in the direction of the right line in which that force is impressed.” His explanation and reference to oblique angles refers to vectors and when the forces are not co-linear. If you remember, Newton’s first law built heavily on the work of Galileo. His second law should also give credit to Descartes and Wallis. Suppose that a 120 kg NASA astronaut on a spacewalk uses her rocket booster pack to accelerate back to the International Space Station. If the thrust delivered by the rocket pack is 24 N, what is the acceleration of the astronaut? A book is pushed across the counter by a melancholy depressed robot. The robot pushes the book with a force 10.0 N. The force of friction is 4.00 N. What is the mass of the book if its resulting acceleration across the counter is4 m/s2? In this case, it would help to draw a free body diagram as we have more than one force. It is worth noting how the units cancel out and the number of significant digits. Leonardo Garber, who has a mass of 25 kg, slides down a pole at the playground. If Leonardo’s acceleration towards the ground is 4 m/s2, what is the force of friction between his hands and the pole slowing him down? Since we know both the acceleration and the mass, we can find the Net Force.